By popular demand, a new date has been added for our November Book Club, on Wednesday 28 at 6pm! See the link at right to make a booking. 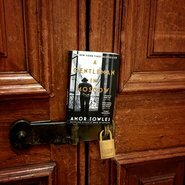 For November, our book will be A Gentleman in Moscow by Amor Towles. A Gentleman in Moscow is available from the Gallery Shop. Buy your copy online.